These Farm Heroes level 230 cheats and tips will help you beat level 230 of Farm Heroes. 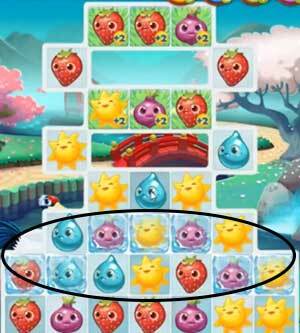 The objective of Farm Heroes level 230 is to collect 60 suns, 60 strawberries, and 60 onions in 18 moves. Usually grass tiles are your best friend for racking up points and knocking the grump out of cropsies, but this time they are a trap. They’re only available in isolated rows of 3 near the top of the level, so the only way to make a match up there is by luck. Forget about them and move on. 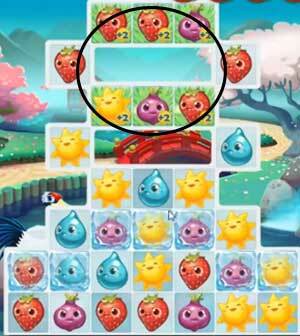 The frozen cropsies block out the entire bottom row of the level. Get the blockers out of the way as soon as possible to make matches easier for yourself. Since the grass is out of the way, and there’s no way to grow more on this level, you’re going to have to take matters into your own hands. 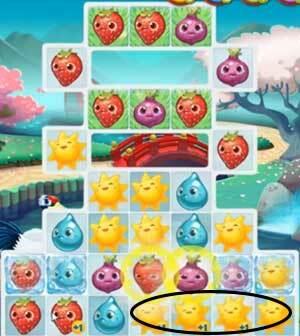 Use 4-6 chain cropsy combinations to scatter +1 bonuses throughout the board to rack up points faster.